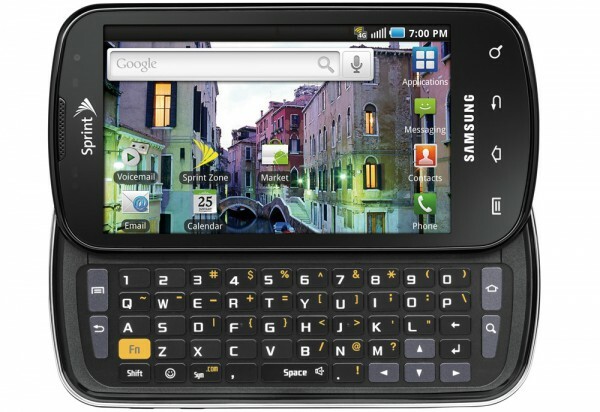 Sprint’s second 4G smart phone, the Samsung Epic 4G, is finally here. Although the device belongs to Samsung’s line of Galaxy S devices, the Epic 4G stands out since it sports a physical keyboard, 4G connectivity, and a front-facing camera. I have been using this device for the past few weeks and it offers plenty to distinguish itself from the well-recognized HTC EVO 4G, which I reviewed earlier this year. With a stunning Super AMOLED display, support for video calls, a built-in mobile hotspot, DLNA media sharing, and Android to top it off, the Epic 4G has a lot to offer. While many admire Apple’s simplistic iPhone 4 design, others appreciate Motorola’s robust robotic build quality. 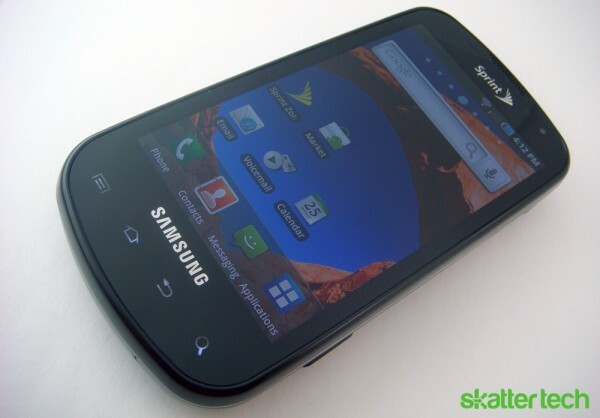 Then comes Samsung’s Epic 4G which offers a clean-cut design while it still packs a punch. Starting with specs, this smart phone sports a 1GHz Cortex A8 Hummingbird Processor, Android 2.1 (Froyo soon), TouchWiz 2.5, 512 MB of RAM, 1 GB of ROM, WiFi b/g/n, Bluetooth 2.1, GPS, and much more. 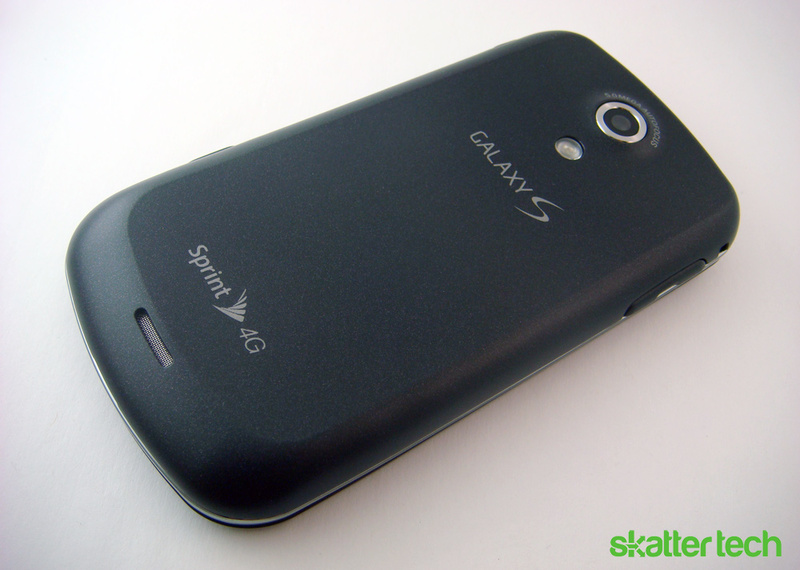 For those wondering, despite the ‘4G’ branding, this phone is completely compatible with 3G networks. While devices such as the Droid X and EVO 4G feature overly large 4.3 inch screens, the Epic 4G offers a more-reasonable 4-inch display. Although that may imply a smaller body, the phone is actually roughly the same height and thicker than the previously mentioned devices. (4.90 x 2.54 x 0.56 inches) Fortunately, the Epic 4G is lighter than most phones with slide-out physical keyboards. It weighs just 5.5 ounces, which is nearly a half ounce lighter than the EVO 4G and Droid 2. When it comes to looks, the Epic 4G is by no means ugly, unlike many other Android devices. 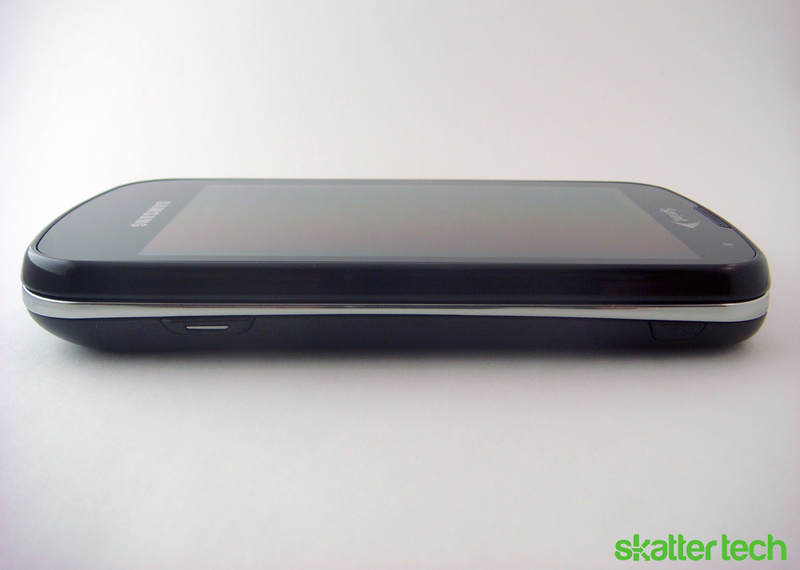 While the iPhone 4, EVO 4G, and Droid X all have sharp edges, the Epic 4G features a curved design, making it comfortable to hold for extended periods of time. 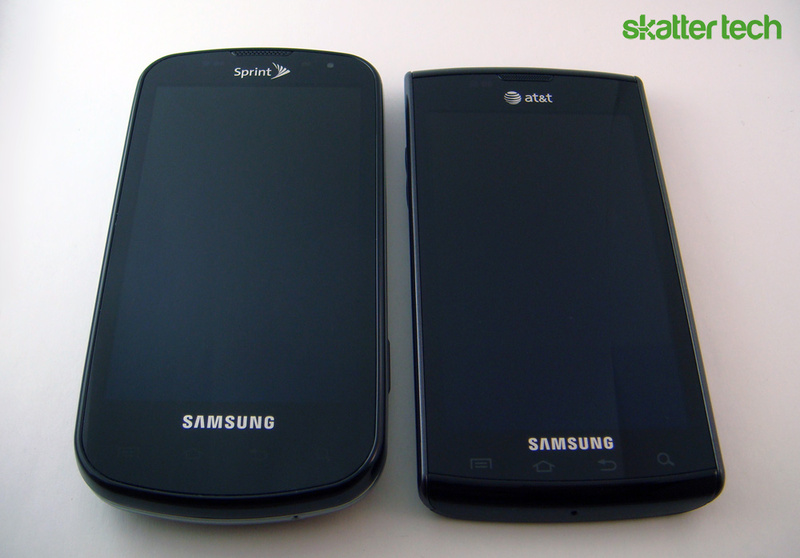 The front side of the phone is a single slab of glass with silver linings for the Samsung and Sprint logos. The Menu, Home, Back, and Search touch sensitive keys are only visible when LED lights underneath turn on, making them somewhat difficult to find. I should note that these keys were fairly unresponsive at times as well. Also beneath the front glass is a VGA front-facing camera, the Super AMOLED display, and a notification LED. Careful observation also reveals an ambient light and proximity sensor. The device also packs a Six-Axis accelerometer inside. The back of the Epic 4G features a dark gray matte finish with a narrow silver bezel for contrast along the edges. The 5 megapixel camera, which has a LED flash directly below it, also has a shiny silver outline. A volume rocker is on the left side of the phone while a camera trigger is on the lower portion of the right side. 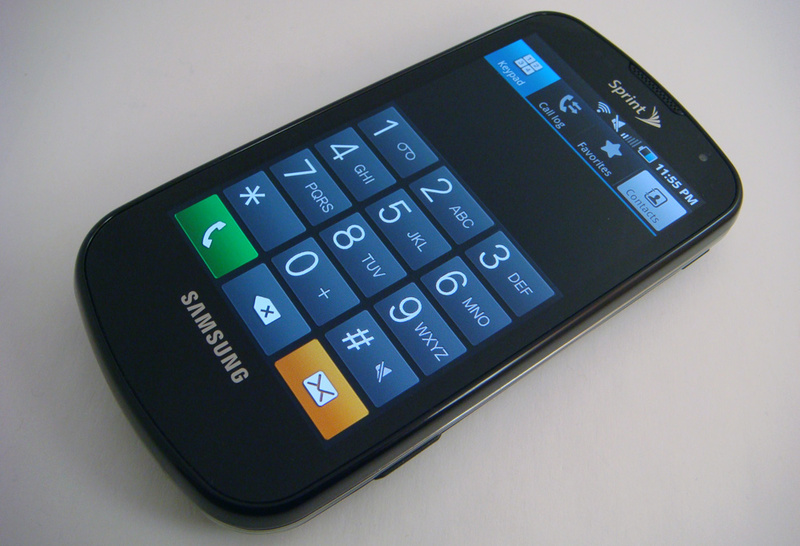 Unlike most phones that have a power button on top, Samsung positions it on the upper right side of the Epic 4G. That isn’t the only oddity either. The microUSB charger/data port, which is generally found on the bottom of the phone, is on top. This makes it awkward to hold during a call while charging. Fortunately, using a Bluetooth headset, speakerphone, or a pair of wired headphones (3.5 mm jack on top) solves that problem. Removing the real plate, which is somewhat cumbersome to pry open, reveals a 1500 mAh battery pack and a microSD card slot (16 GB card included). 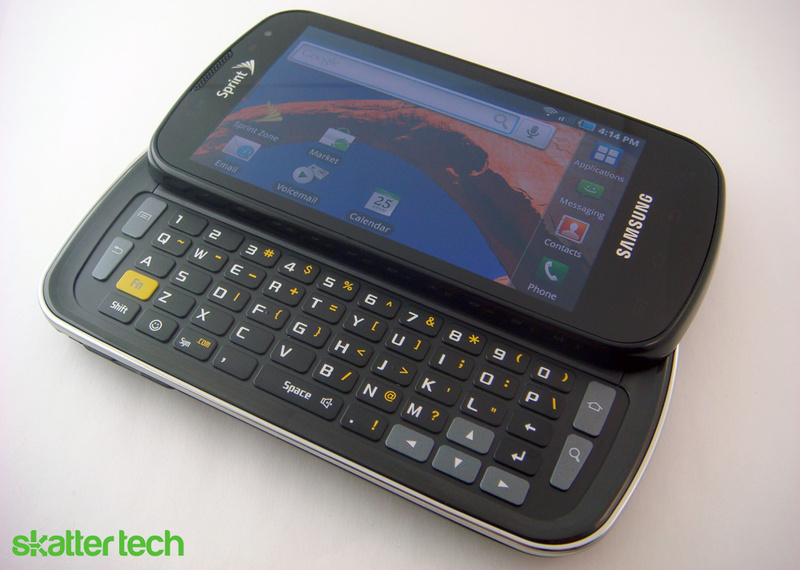 Sliding the phone open to access the keyboard is an effortless task as it has an assisted spring-loaded mechanism. In terms of durability, the Epic 4G is robust enough to last through a few years of reasonable wear and tear. Although I had used an AMOLED display before, I hadn’t spent much time with a Super AMOLED screen until I got my hands on the Epic 4G. With a 480-by-800 pixel resolution on a 4-inch screen, it offers more pixels per inch (PPI) than the EVO which has the same resolution on a larger display. Within just a few minutes of use, I was extremely impressed with the rich colors and dark blacks it offered. The screen has such miniscule light leakage that I thought the white Samsung logo on the black start-up screen was a sticker I hadn’t removed. While Droid Incredible, which we reviewed last year, suffered visibility under direct sunlight due to a AMOLED screen, the Epic 4G is definitely easier to see due to Samsung’s screen technology. Unlike the average smart phone screen that generally has poor viewing angles, the Epic 4G looks incredible at even the most extreme angles. It is just as good, if not better than Apple’s IPS Retina display. The Super AMOLED displays performs best for viewing images and movies. 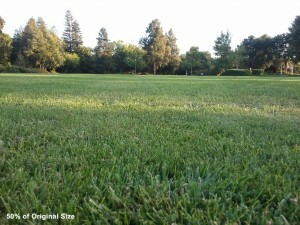 It creates a sense of depth and makes the picture quality appear more natural. 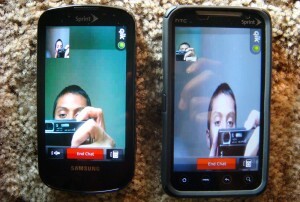 In comparison, the HTC EVO and especially the Motorola Droid X appear faded. However my biggest gripe comes with reading text: font rendering is horrible. Despite a decent PPI, text isn’t nearly as smooth as an iPhone 4 or even the HTC EVO for that matter. Zooming into text helps a bit, but not by much. Edges of characters are abrupt, choppy, and jagged, offering a unpleasing experience. It’s by no means difficult or necessarily hard to read text, but it could be a lot better. I should also note that when placed besides the Droid 2, colors on web pages on the Epic 4G were “blue-ish.” But for the most part, most people won’t even notice until someone points out these issues to them. The software on the Epic 4G is a tad hit or miss. While Android Froyo 2.2 is the latest version of Google’s mobile OS, the Epic 4G still runs on Android v2.1. A few weeks ago, Sprint’s corporate communications team told Skatter Tech that they were working closely with Samsung to deliver the upgrade over-the-air within a 7-8 week period. Despite that, there have been no official confirmations on a finalized date. The EVO 4G and Droid 2 already run on Android 2.2. In addition to all the standard Android goodies, the Epic 4G features Samsung’s special TouchWiz 2.5 interface. Much like HTC Sense UI and Motorola MotoBlur, the overlay offers some additions and enhancements to the stock operating system. While some may despise it, I found TouchWiz less intrusive than Sense UI and better-looking than MotoBlur. TouchWiz is also well polished, smoother, and snappier than most other overlays. Samsung also added an impressive “inertia” experience, which I haven’t seen on an Android device until now. It is the same feature that stuns any first-time Apple iOS user. Scrolling through pages or menus is extremely responsive and sensitive. Despite those advantages, the Epic 4G lacks some TouchWiz features that other Samsung Galaxy S variants such as the AT&T Captivate offer. Missing items include an interactive music player, a daily briefing widget, and a puzzle lock mode. The dock isn’t customizable forcing users to stick with the default Phone, Contacts, Messenger, and Application Launcher icons. Unlike the native Android infinite scroll application list, the Epic 4G offers left-to-right side-scrolling pages. Unfortunately, users can’t rearrange items on these pages either. However, Samsung didn’t strip out the quick-setting feature for enabling or disabling WiFi, GPS, 4G, and Blueooth from the drop down notification bar. Although Google doesn’t recommend using a task killer with Android 2.2, it’s commonly used on Android 2.1. Since Samsung didn’t want customers dealing with poorly developed solutions from the Marketplace, they bundled their very own Task Killer. Holding down the home key brings up the application switcher with a button for accessing the task manager. The program makes it easy to kill rouge processes and to remove unwanted apps. It is a great way for geeks to manage Android, but it might be too complicated or may add unnecessary confusion for the average user. While many users complained about the fact that HTC Sense UI includes duplicated functionality with sub-par clients for social networks, Samsung took some hints and avoids that issue with TouchWiz. There is native integration for contact syncing with Facebook, Twitter, and MySpace, but that’s it. TouchWiz leaves room for installing official social networking apps such as Facebook and Twitter or even choosing 3rd party solutions such as Seesmic or TweetDeck. While most Android phones come pre-installed with a document viewer for PDFs and office documents, most lack the ability to edit files. Although there are many 3rd party solutions in the marketplace, the good ones aren’t free. To solve that problem, Samsung bundles a full version of ThinkFree Office with the phone. It’s a clean well-integrated experience that every user will appreciate. Editing documents with a physical keyboard only makes the experience easier and faster. Unfortunately, my complements only go so far. I soon found a set of pre-installed applications which weren’t removable. While I didn’t mind AllShare (for DLNA Media Sharing), Amazon Mp3, Qik (for Video Chat), Sprint Hotspot, and ThinkFree Office, others such as Asphalt 5, MediaHub, Sprint Nascar, Sprint Football, Sprint Navigation, Sprint TV, and Sprint Zone are apps I never use. Drawing a parallel to bloatware on Windows computers, pre-installed programs aren’t hard to remove. On the other hand, these Android apps are a part of the ROM, meaning that they are here to stay. Believe it or not, the Epic 4G technically comes with four methods of text input: a physical keyboard, an Android keyboard, Swype, and voice-to-text. The slide-out physical keyboard is extremely large and keys are well spaced out. The design is reminiscent of the layout on the Windows Mobile based HTC Touch Pro 2. There are 5 rows of keys with a dedicated row for numbers. The keys are rectangular, flat, and smooth. There is even a D-pad and dedicated buttons for Menu, Back, Home, and Search on the keyboard. The function command offers quick access to secondary characters such as punctuation as well. There are even customizable built-in keyboard shortcuts. For instance, holding down the Search key and a letter will launch an application. Although I found typing with the Epic 4G more comfortable than with the slightly cramped keyboard on the Droid 2, there was one major issue. Unlike regular keyboards that have a somewhat angled layout, the keys on the Epic 4G are arranged in a perfect grid, making it awkward to use at first. As for the virtual keyboards, I found myself using them more often than not, despite a built-in physical keyboard. Typing with Swype for sending a quick text message or search the web is much faster than having slide out the keyboard each time. However, when it comes to typing out lengthy emails, the physical keyboard is well appreciated. The original Android keyboard also comes bundled in, but with Swype, there’s no real reason to use it. However, Google’s Voice-to-Text input, is an impressive feature. While it isn’t perfect, it’s amazingly accurate. Using it to dictate a quick phrase of text while multitasking or your hands are full is surprisingly practical. 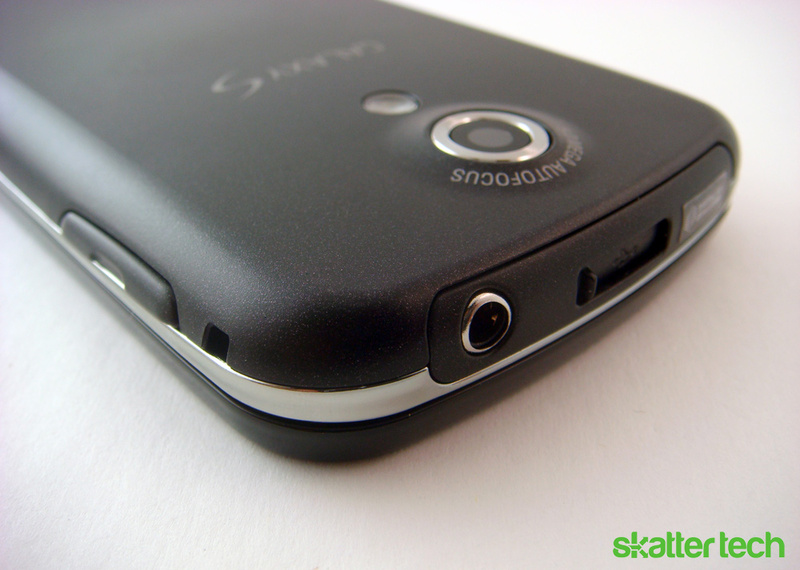 The Epic 4G houses a 5 megapixel camera and a VGA front-facing camera, both of which are a step down from the 8 megapixel camera and the 1.3 megapixel front-facing camera on the HTC EVO 4G. Considering that megapixels don’t necessarily correlate with better image quality, I thought I’d give it a chance. Unfortunately, I wasn’t impressed with either camera. Starting with the main 5 megapixel camera, images were fairly good-looking in bright out-door conditions. But when it came to low-light conditions, photos quickly began to discolor and appear “grainy.” The built-in LED flash, which is missing on other Galaxy S variants, helped improve image quality, but not by much. 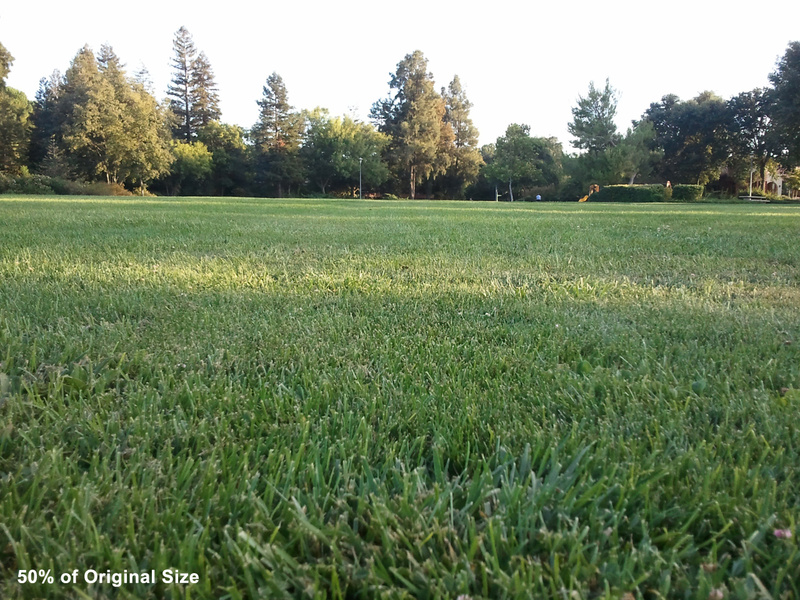 The image quality in dark environments on the Droid X and EVO 4G which sport dual LED flashes is better. 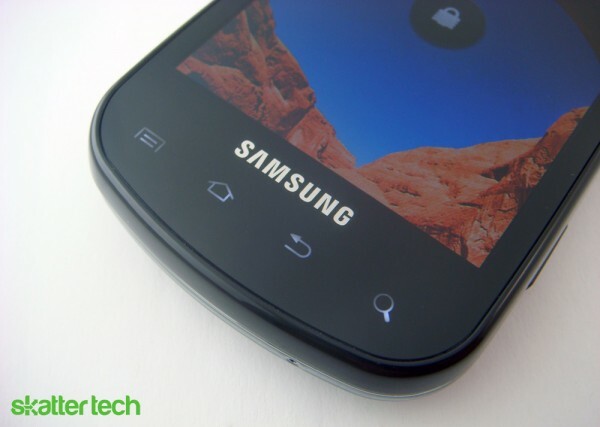 The TouchWiz camera launcher starts up in just a second or two. Samsung includes plenty of extra features including adjustments for exposure levels, white balance, ISO, and metering. There are also custom photography modes for Self Shot, Beauty, Smile Shot, Continuous, Panorama, Vintage, Add Me, Action Shot, and Cartoon. Image stabilization, guidelines, auto-focus, face detection, macro mode, a countdown timer, and blink detection are just a few of the other added extras. The quality of the front front-facing camera was another letdown. The iPhone 4, which houses a same VGA resolution front-facing camera, looks significantly better. The software also doesn’t appear to support video recording, limiting users to stills in self-portrait mode. And when it comes to video calls, faces are blurry, discolored, and stretched. On the other hand, EVO to EVO video calls are much clearer, making for a more practical solution. When it came to 720p video recording with the main camera, quality wasn’t nearly as great as the EVO 4G or Droid X. But for a gadget that will be with you at just about all times, image and video quality is by no means disappointing. The inclusion of a physical shutter button is a nice touch and is something the EVO lacks, but the Epic 4G won’t be replacing a dedicated point-and-shoot camera anytime soon. Just like the HTC EVO, the Epic 4G also comes bundled with Qik for video calls. 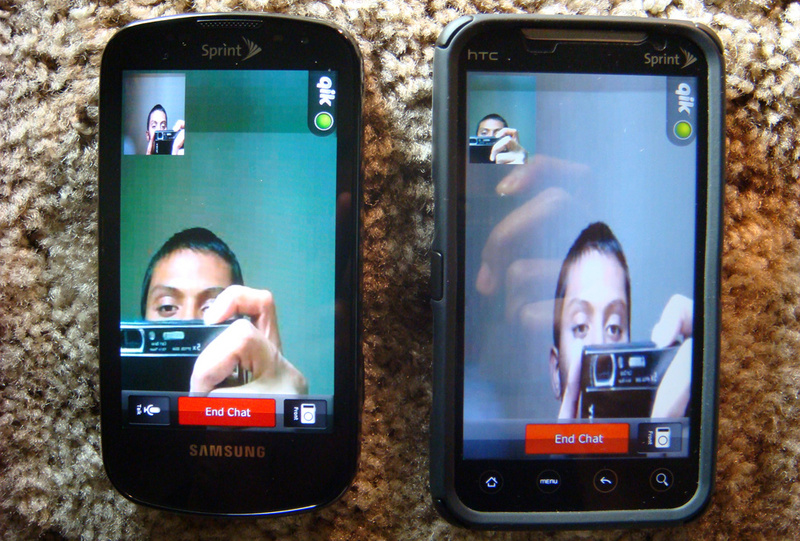 Unlike the iPhone 4 that can only place FaceTime calls on WiFi networks, the Qik works on 3G and 4G networks as well. I was also glad to find that the Epic 4G could seamlessly connect with EVO 4G devices for video calls. Unfortunately, there are still some underlying issues. Unlike FaceTime which can initiate video calls with any iPhone 4 with no additional configuration or setup, Qik requires registering for a user name. In addition, I found that dialing a phone number to connect with another Qik user didn’t always work. It turns out that users need to manually associate phone numbers with their account on Qik.com, the mobile app doesn’t offer a setting to make that happen. Unfortunately, since most users are unaware of that option, the only way for Epic and EVO owners to connect with one another is by sharing their Qik user name which is a nuisance. It’s especially annoying considering that the main Video Chat page in the Qik App displays a list of phone numbers imported from the phone’s contact list. Further frustrating is the fact that there’s no way to save Qik user names to existing contacts or to even create a favorites list. If you thought the experience would be better once in a call, you are wrong. For some odd reason, Qik requires the recipient of a video call to hold down a “talk” button when speaking. Interestingly enough, the person who places the call gets a hands free experience. Unfortunately, the recipient will always feel as though they are using Walkie Talkie or Yahoo Messenger voice chat in the early days. Aside from those complains, the rest of the experience is actually decent. The interface allows for seamlessly transitioning between the front-facing and the rear cameras. Tapping the preview thumbnail also tells the camera to re-focus the image. Video calls were a bit pixelated when on 3G with weak signal, but the quality was excellent on 4G and WiFi networks. When it comes to dealing with music, movies, and photos, the Epic 4G doesn’t stutter. While it lacks the interactive Samsung Music Player featured on other Galaxy S devices, the default Android app still gets the job done. While it could use many improvements, the stock version has four simple tabs for browsing by Artists, Albums, Songs, and Playlists. There’s also a Party Shuffle, Shuffle All, and Repeat mode, but that’s about the full extent of the interface. As for pictures and videos, the Epic 4G sports a fairly impressive interface. Sets of “stacks” display images and videos from different folders and sources. Selecting a stack spreads out the items within it for easier viewing. There’s a built in slideshow mode, pinch to zoom, an option to rotate images, and built in sharing options. It’s rather one of the better gallery apps I’ve come across on an Android device. I should also credit Samsung for embedding an amazing DLNA client. It supports streaming content from other devices, sharing local content with other devices, and controlling playback on networked devices. While the Droid 2 and Droid X also support DLNA, the Epic 4G adds support for additional codecs such as as XVID and DIVX. After just a few seconds of buffering, a 720p movie trailer started playing on my Epic 4G over my 802.11 n WiFi network. Samsung even goes an extra mile and includes a microSD to SD Card Adapter, a modular USB cable, and a pair of headphones with interchangeable buds in the packaging. Although currently unavailable, Samsung’s very own Media Hub will bring movie downloads and rentals to the Epic 4G over. The app even even supports progressive viewing so that users won’t have to wait for file to fully download to begin watching. When it comes to placing calls, the Epic 4G is by no means extraordinary. For instance, the Motorola Droid 2 and Droid X offer impressive crystal clear audio quality and noise cancellation, which can’t be said about this phone. While audio quality isn’t problematic, it could definitely use a second microphone for noise reduction. As for dropped calls, Sprint’s network didn’t fail even once in the same areas that AT&T repeatedly lost signal (San Francisco Bay Area). The dial pad on the Epic 4G is fairly simple. There’s a alphanumeric keypad that brings up results of a name or number from the contact list. A confirmation and click of the talk button initiates a call. It’s not nearly as impressive as the search feature built into the dial pad that comes with HTC Sense. However one neat addition was a drag and drop feature that appears to interact with an incoming call. Users need to drag a button from the center of the screen onto the intended action instead of clicking on an Answer or End Call button. 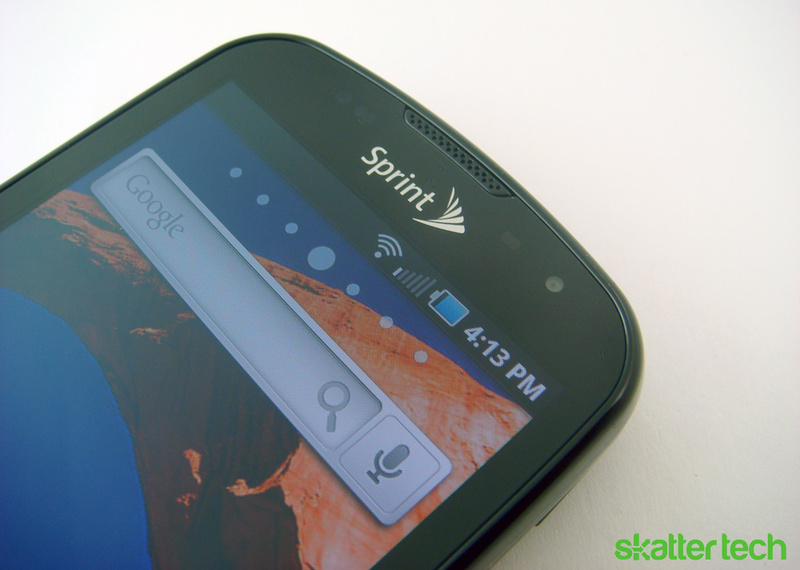 Other than that, Sprint includes a visual voice mail app, but Google Voice works great as well. I spent a few hours testing the Mobile Hotspot on the Samsung Epic on both 3G and 4G networks. The phone can handle up to 5 users at any given time. The software allows for renaming the SSID or even hiding it. Users can pick a WPA password or leave the hotspot open as well. There’s also an option to select a channel and to limit the maximum number users. An auto shut-off mode turns off the hotspot at a selected time interval to preserve battery life, but an always-on mode is also available. I should note that the EVO 4G offers a maximum of 8 simultaneous users and MAC address filtering, which the Epic 4G lacks. As for speeds, I maintained about 1 Mbps for download speeds and 700 kbps for upload on average. However in 4G areas in the San Francisco Bay Area, I hit speeds of nearly 4.9 Mbps for download and 999 kbps for upload. I even placed a Skype video call my laptop without even realizing I was running on a mobile hotspot and it worked seamlessly. I should also note that unlike AT&T and Verizon Wireless, Sprint doesn’t have any data caps for 3G or 4G networks. While unlimited mobile data is included for services on the phone, enabling the mobile hotspot feature costs an additional $30 per month. Considering that it is cheaper than the $60 per month plan for the Sprint Overdrive 4G, it isn’t necessarily a bad deal. While many critics denounced the HTC EVO 4G for a subpar battery life, the Epic 4G offers some improvements. While Sprint doesn’t disclose any official estimates, a representative said that this phone was a “6:00 pm phone,” while the HTC EVO was a “3:00 pm” phone. From my testing, my Epic 4G easily lasted over 12 hours before full depletion. My usage generally consists of checking emails, sending text messages, browsing the web, listening to music, streaming Pandora, quick tests of the Mobile Hotspot, placing short Qik video calls, getting directions, and snapping a few photos. I should note that most of my testing was in a 3G area. According to most reports leaving the 4G radio on depletes battery life even faster, but it is a sacrifice you may want to make if you want faster speeds or the ability to use data during a phone call. While the Mobile Hotspot feature is great, keeping a charger around on hand is important. It will fully deplete the Epic’s battery in just a little over 3 hours. The same goes for Google Navigator, making it vital to own a car charger for long commutes or trips. Samsung claims that the Super AMOLED screen technology saves battery life, however our Android battery manager indicates that the scree accounts for nearly 50% of battery consumption. Heavy users will be glad to hear that the internal battery is replaceable. Samsung even sells a standalone battery charger. For the most part, the battery life is long enough to last through a day for the average user. 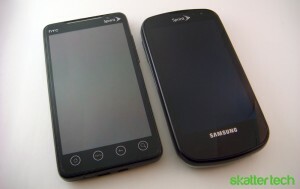 When it comes to selecting a phone, recommending the Samsung Epic 4G over the HTC EVO 4G is a hard call. It offers some advantages, but has some drawbacks as well. It comes down to user preference for features such as a physical keyboard or DLNA on the Epic 4G or a kickstand and micro HDMI on the EVO 4G. From Sprint’s lineup over just the past few months it’s clear that these are the first of many upcoming powerful 4G smart phones. While it is somewhat disappointing that this phone doesn’t have Android 2.2 just yet, the update should reach the phone this month bringing Adobe Flash, performance improvements, Chrome to Phone, and many other features. With Swype pre-installed, a Mobile Hotspot, Video Calls, 720p video recording, an impressive Super AMOLED display, DLNA media sharing, and more, the Epic 4G won’t disappoint. The Epic 4G is now available for $250 after a $100 rebate and signing a new two-year contract. Watch out for faulty capacitive keys. I’ve only had for a total of 1 hour when my home key was not as responsive, returned it the next day to now have a phone with a faulty back key that works only half the time. Not sure how possible it is to get two lemons with one customer all within less than 24hours of the phone. At first figured I was doing something wrong pushing the buttons, but read that it may be the biggest downfall of the phone. look i had the samsung intercept 2 months agao had probs w the hme keys and just the soft keys period. fter my mishaps i would never get a samsung phone again i know too many people w probs that have samsung phones. a bunch of crap! thats why i have the htc evo. the sweetes phone on the market right now! I can attest to this. my friend had a Samsung phone on Verison that was returned 6 times before they made him choose another. I’ve had massive, unforgivable problems with my Samsung Moment and it has already been returned once. my Samsung TV turns itself off randomly. I have no trust for Samsung products to perform or, especially, last. Be extremely weary when considering a Samsung product. SCAM ONLY 340MB OF RAM Sorry but your wrong about the 512mb of ram.Samsung is running a scam and people need to start posting all over the web about it. The phone only comes with 340mb of available ram.I know because I own 2(mine and my fiances).They decided to use the other 172mb for a ram disk it seems.Devs are trying to figure out why.I didnt realize this until I got home and used an app that shows available ram. when using Memory Booster Lite.Please post this information where ever you can they should not be able to get away with this. Will Android 2.2 support Bluetooth headset hands-free dialing on the Epic 4G? Android 2.1 does not. EPIC is the best for me.I really like keyboard.Glad that I returned evo to sprint! I activated my mobile hotspot on my epic and i was able to get the signal to my computer but the internet wont work. Is there something i’m not doing? Once you are connected then you should have internet right away. Worked for me with no trouble at all.